We have torque! 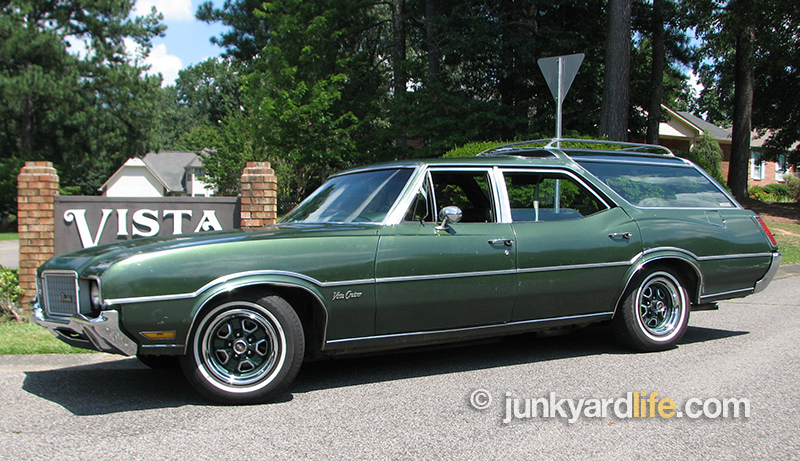 The plan to make Ron Kidd’s 1972 Oldsmobile Vista Cruiser a 455-powered rocket ship took a different route than planned. Ron delivered his 1973 Olds 455 power plant to the machine shop with every intention of having a full rebuild. After three months in the on hold bin, Ron retrieved it because he bought a ready-to-install 1969 Olds 455. 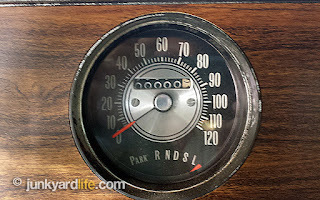 This was the fast track ticket to big torque in GM’s glassy A-body wagon. 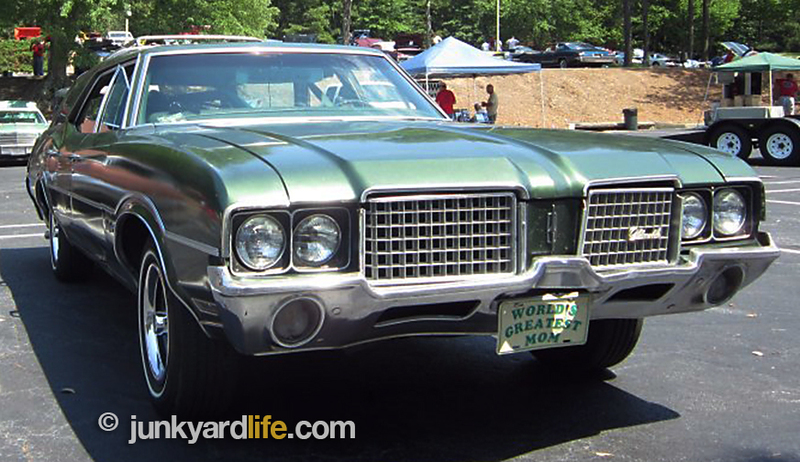 "World’s Greatest Mom" tag makes a 455-powered wagon a genuine sleeper. 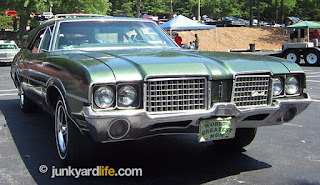 The Olds 350 that served the ’72 Vista was running well overall but it had almost 200k miles on the clock. Lots of quirks were making themselves known, like lunching on three oil pumps. A screechy flywheel. Leaky main seal. Unbalanced balancer. Yes, the old girl was tired. 1972 Olds 350 sits on engine stand after being yanked from its birth home in the Vista Cruiser. The Olds 350 has been yanked. I am going to tag it and keep it on a stand. This is actually the numbers matching number for this very car. The numbers are located on the left front side of the block just under the cylinder head. 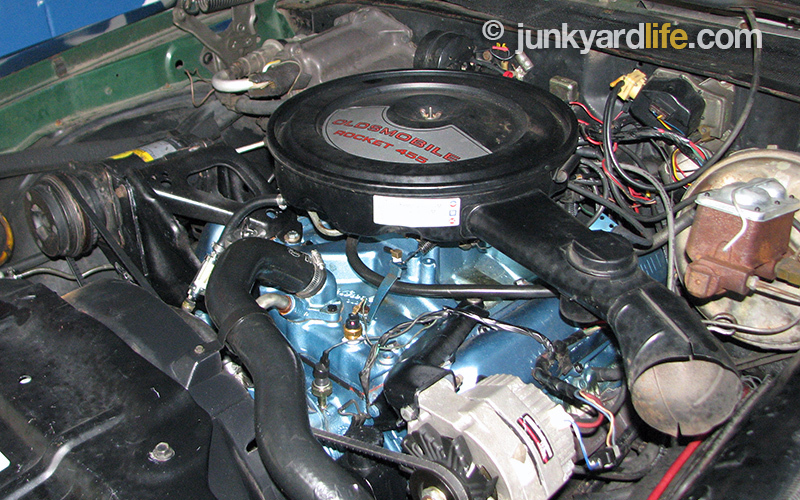 The Edelbrock valve covers (shown above) were added to the 350-V8 after the swap so I could use the cool Oldsmobile scripted ones on the 455. 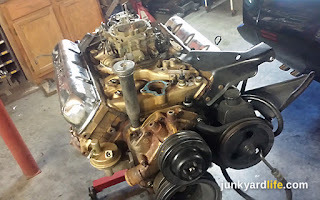 The incorrect Chevrolet Quadrajet carb was also perched up there after the fact to keep the intake from being open to disaster. The correct front feed B.O.P (Buick-Olds-Pontiac) carb is the one installed on the 455. A beauty in blue. 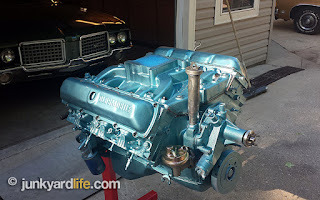 The 1969 Olds 455 engine, assembled and ready to supply torque in spades. Take a 1969 issue 455 Oldsmobile from a Delta 88 (yay!) with 1973 “J” heads (boo!) and combine the two in the hopes the compression will land at a pump fuel friendly 9:1 or so ratio. I shall add a heavy duty radiator and an extra hard working water pump. I shall install an aluminum intake and a pair of aftermarket Thornton exhaust manifolds to free up a breathing a bit. For insurance, a new Melling regular volume oil pump. A guy can get thirsty, so I acquired a new fuel pump as well. So all the pumps are covered. To lite the fires within, an H.E.I electronic ignition is in order. 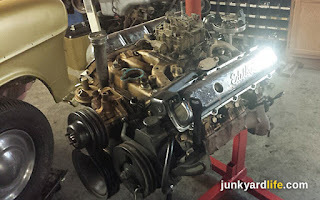 New gaskets and correct 1972 Oldsmobile blue paint to cover it all up will finish up the power plant in our beach buggy. 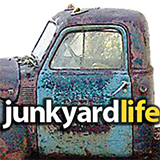 This was a straightforward engine swap with few unwanted surprises. 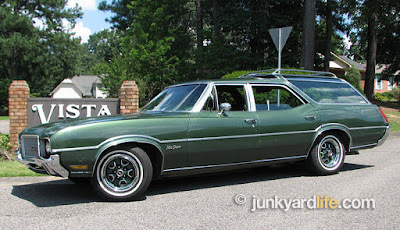 We knew that a 1972 Oldsmobile Vista Cruiser was offered with a fat 455. However, mine was not born that way, so I had a shoehorn and a big hammer ready. Luckily they were not needed because many of the parts were interchangeable, except for the motor mounts and frame perches. The odometer has been reset and the wagon is hitting the road. I’ll keep you posted on performance increases after the engine break-in period. Installed! Bigger is better if we’re talking muscle car era engines. A 1969 model 455 Olds engine now powers the ’72 Vista Cruiser. The cast iron intake was so heavy, it felt much like carrying a person. I dropped it in favor of the aforementioned aluminum Edelbrock intake. Speaking of dropping — if you are going to drop one of these intakes, do not let it be that stock one. Ow! 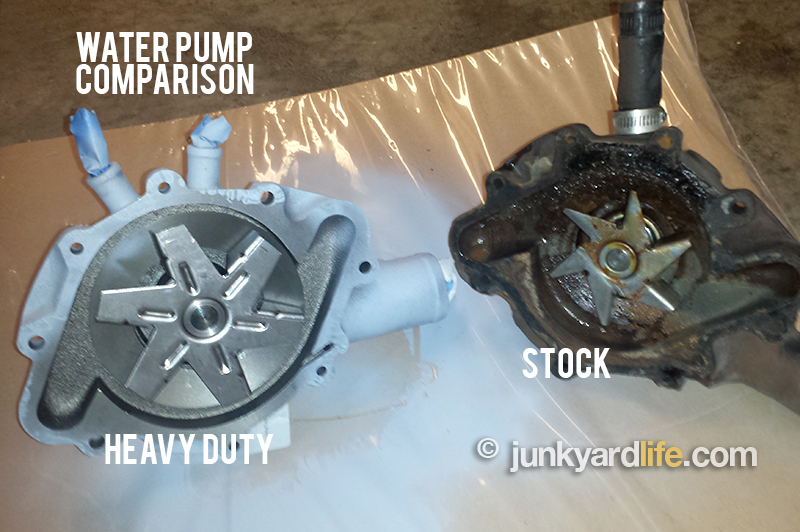 There is a difference in stock water pumps and heavier duty units (photo below). The differences are surprising. Comparing stock water pump versus the heavy duty one used on the 455 engine swap. A 350 Olds and a 455 Olds require different motor mounts. We knew that. However what we didn’t know and found out the hard way that the swap requires significantly different 455 frame perch mounts. Luckily, they do bolt to the frame’s existing holes. Taking no further chances, I scavenged them from a 1970 Vista Cruiser that sported a 455 in it’s younger days. Thank you Top Secret Undisclosed Storage Facility. The new and old exhaust manifolds dump into the SAME place! Thus, saving us average guys from a trip to the exhaust shop. There are manifolds to have and ones not to have. We had the worse ones we could have. Single exhaust crossovers and heat risers are not your friend. Thornton provided a correct appearing set of manifolds for 1972 that flow a little better than rock stock with no evil performance prohibitors. 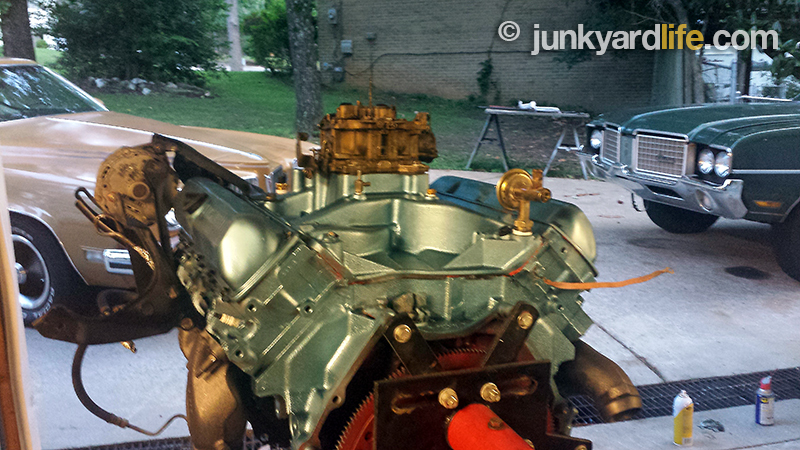 Carburetor sits high atop the intake on the Olds 455. The carburetor base on the new 455 Performer intake sits about 4 inches higher than the 350 Performer intake (see photo above). 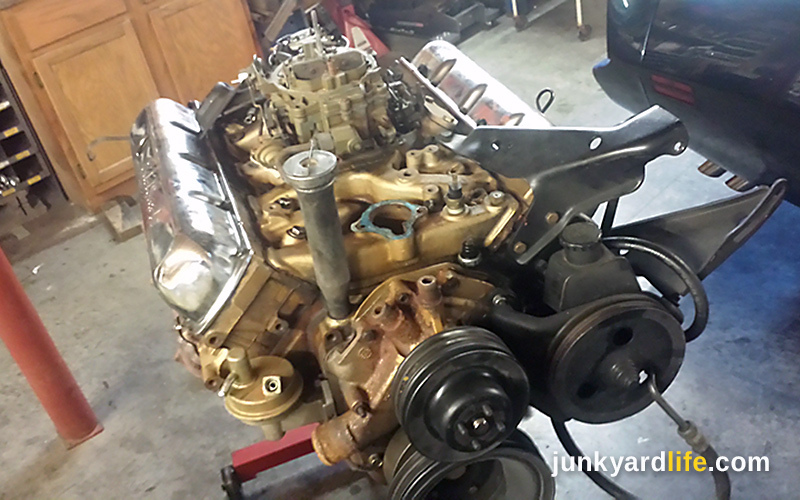 The carb sits higher than the valve covers and gave me daymares about the hood not closing. I called Edelbrock and they seemed to think it would fit. They have notes on that kind of thing. To relieve your suspense, it did close. Barely. The Olds 350-V8 will get tagged and bagged. Okay, not bagged because it’s not officially dead, just shoved into the corner next to that other 1973 455-V8. A lot of things fit the big motor from the small motor. The most surprising to me was the valve covers. A pleasant surprise was the electronic ignition parts. Cool! Note: The control module/rotor/cap/coil-the H.E.I distributor itself was different. 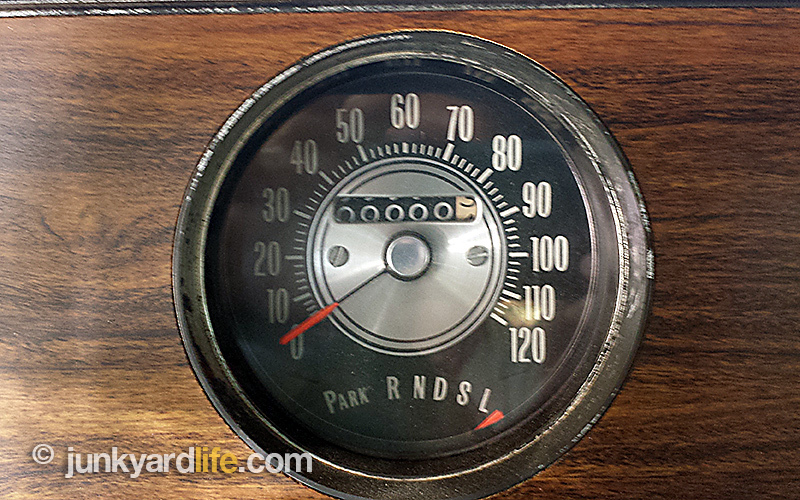 Ron reset the odometer in the 1972 Vista Cruiser when the new 455 engine was installed. Now he’s gently breaking in the engine. Right, Ron?